This week EWG published a timeline that illustrates the scope of proposed regulatory limits for toxic fluorinated chemicals, also known as PFAS. 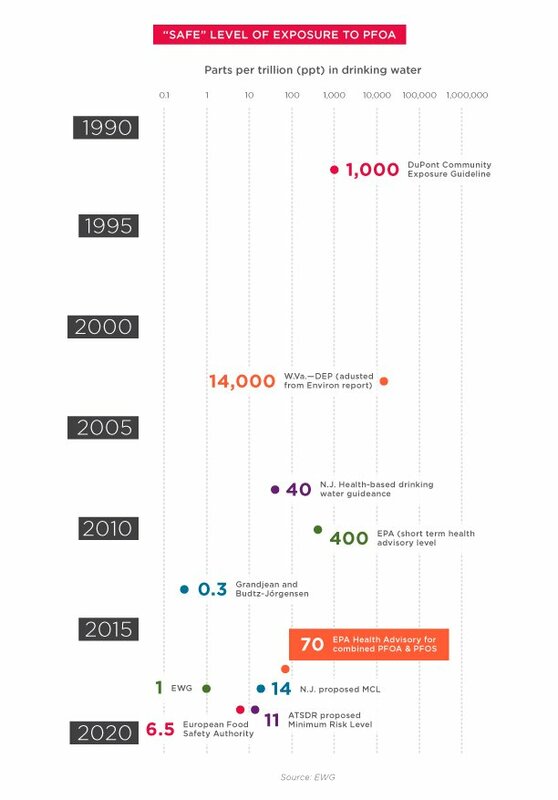 The trend clearly shows that since 1991, the levels of PFAS that are deemed safe keep getting lower. Some research shows there is no safe level of exposure to these nonstick compounds. EWG researchers estimate these chemicals are found in the drinking water of about 110 million Americans – a continuing crisis that needs a serious plan to be resolved. Also in PFAS news, the Centers for Disease Control and Prevention is seeking volunteers who live near current or former military installations to be tested for PFAS chemicals. EWG contends that though this proposed testing is encouraging, more exposure routes and geographic regions need to be considered during this process. PFAS chemicals are found every time a water system is tested. It’s crucial to learn who is contaminated and at what levels, and the extent of this toxic pollution. On Thursday, the Food and Drug Administration released a proposal for new sunscreen regulatory guidelines – a huge step toward reining in a largely unregulated industry. The Environmental Working Group, an outspoken advocacy group that works to eliminate dangerous chemicals in products, says the rule is a "major win for public health," and pursues changes they've been pushing since they started looking at sunscreen 10 years ago. The group only recommends mineral sunscreens because they say chemicals used in sunscreen can be absorbed into the skin and disrupt hormones, or be inhaled when people use spray sunscreen. Environmental Working Group (EWG), a nonprofit health and environmental advocacy group, called the proposal a “big step toward cleaning up a largely unregulated industry.” “We expect many companies to quickly reformulate to avoid those ingredients that the FDA considers unsafe or for which there is not enough data to prove safety,” said Scott Faber of EWG on a press call after FDA’s announcement. Environmental advocates praised the proposal. “For a decade, EWG has worked to raise concerns about sunscreens with oxybenzone,” said David Andrews, a senior scientist at the Environmental Working Group, an environmental advocacy nonprofit. “Today, the FDA recognized those concerns and said oxybenzone and 13 other ingredients are not classified as safe and effective for use.” Reprinted by 56 media outlets. Environmental Working Group (EWG), a nonprofit health and environmental advocacy group, called the proposal a “big step toward cleaning up a largely unregulated industry”. “We expect many companies to quickly reformulate to avoid those ingredients that the FDA considers unsafe or for which there is not enough data to prove safety,” Scott Faber of EWG said on a press call after FDA’s announcement. The Environmental Working Group (EWG), a watchdog organization for consumer health, called the new initiative way overdue. “After more than 40 years, the FDA is at last taking serious steps to finalize rules that would require sunscreen companies to make products that are both safe and effective,” David Andrews, senior scientist at EWG, said in a news release. Reprinted by UPI, U.S. News & World Report and 101 other media outlets. Environmental Working Group (EWG), a nonprofit health and environmental advocacy group, called the proposal a 'big step toward cleaning up a largely unregulated industry'. Calls seeking comment from industry groups on the proposed regulations were not immediately returned Thursday. But an official with the Environmental Working Group said the regulatory review is long overdue. “After more than 40 years, the FDA is at last taking serious steps to finalize rules that would require sunscreen companies to make products that are both safe and effective,” David Andrews, an EWG senior scientist, said in a statement. “Today’s announcement will cause a sea change in how sunscreens are formulated,” Environmental Working Group senior scientist David Andrews said in a press call today. "The FDA is at last taking serious steps to finalize rules that would require sunscreen companies to make products that are both safe and effective," David Andrews, a senior scientist at the nonprofit advocacy organization Environmental Working Group (EWG), said in a statement. The EWG, which focuses on environmental issues and public health, has previously raised concerns about the chemical oxybenzone. “This is going to completely overhaul the entire sunscreen market,” says David Andrews, the senior scientist at the watchdog organization Environmental Working Group, which releases a yearly guide of safe sunscreens and held a conference call about the news Thursday. According to David Andrews, a senior scientist at the Environmental Working Group, the burden to prove whether active ingredients like oxybenzone are safe is on the industry, and, if it cannot do so, those will be disallowed from over-the-counter sale. Dr. Weil: Cosmetics And Early Puberty? And you can learn how to avoid other chemicals in personal care products by following the Environmental Working Group’s guide to personal care products called SkinDeep. Attitude, a Montreal based company, whose products are developed in their in-house lab where they meet all of Ecologo’s standards are vegan and plant-based. Their products are tested in an independent lab for the absence of cancer-causing chemicals like 1,4-dioxane and ethylene oxide. They are also EWG verified. Start by washing your hair with Herbal Essences Sulfate-Free Honey and Vitamin B Shampoo and Conditioner, a long lasting hairstyle starts with a solid foundation and this has just the right amount of hydration to keep hair shiny and healthy! Added bonus – the shampoo is verified by the Environmental Working Group [EWG] for its clean formula. Pinal has received more federal farm subsidies than any other Arizona county — $571 million from 1995 to 2017, according to a database kept by the Environmental Working Group. The Shedds were among them, gaining nearly $2 million from a program that pays farmers when cotton prices fall too low. But the Environmental Working Group lists sodium phosphate (a common type used in over 6,000 food products) as a “moderate concern” in foods, and there has been quite a bit of research linking it to potential health risks. Higher phosphate intake has been associated with increased risk of death for people with kidney disease. The Department of Agriculture is endorsing the “motto” of the American Farm Bureau and other farm industry groups that “the customer is always wrong,” said Scott Faber of the Environmental Working Group, just one of several environmental groups that had tried to push the administration to endorse a plan for a broader, more transparent national labeling system that favors consumer awareness. While the curtains of the future won't arrive in your big blue bag until 2020, you don't have to wait to clean up your home's air quality. According to the Environmental Working Group, the top chemicals of concern include VOCs, flame retardants, PVCs, PFCs, and antimicrobial agents like triclosan. The average level of glyphosate in cereal samples was 360 parts per billion (ppb), which FOE noted is more than twice the level set by Environmental Working Group (EWG) scientists for lifetime cancer risk in children. Some of the cereal samples contained residues as high as 931 ppb. But eating organic is so important—and it doesn’t have to cost a fortune. The Environmental Working Group even releases their annual Clean 15 and Dirty Dozen list to push people towards eating organic when it really matters while saving money on less toxic conventional options. Chemical sunscreens are by far more common on store shelves. Oxybenzone was found in two-thirds of the products surveyed in 2018 for the Environmental Working Group's annual sunscreen guide. But the number of mineral-based sunscreens had grown 41 percent since 2007, the guide also found. Reprinted by Naples Daily News. Anytime you go to the beach or spend any time outside (remember you can get a bad burn on the slopes!) you should apply sunscreen that contains micronized zinc oxide and/or titanium dioxide. You want to avoid sunscreens with octocrylene and oxybenzone. The Environmental Working Group also advises against 4MBC, butylparaben and octinoxate. The plan “perpetuates the agency’s record of foot-dragging,” the Environmental Working Group, an advocacy group, said in a press release. It would not stop the use of PFAS chemicals in consumer products or prevent the introduction of new chemicals in the class, the group said. It also does not mandate cleanup of contaminated water supplies. “The public and possibly EPA are largely unaware of exactly where these chemicals are used, stored and potentially released to the environment,” said EWG’s senior scientist, David Andrews. “EPA should add PFAS to the Toxic Release Inventory and publish information on production and use locations for this entire family of troubling chemicals.” The inventory is the EPA’s public database on toxic chemicals. “This is a national contamination crisis at this point, and we’ve really only scratched the surface in understanding how large of an impact it’s having on health, both in highly contaminated communities like Clovis and across our entire population,” said David Andrews, a senior scientist for the Environmental Working Group, which leads a campaign to regulate the compounds. Reprinted by The Guardian, Santa Fe New Mexican, Dairy Business and El Semanario. 2012: The EPA directs large public water systems to test for PFAS. The results suggest that as many as 110 million Americans are exposed to PFAS in their drinking water, the Environmental Working Group finds. Up to 100 million additional people are exposed to water with lower levels of PFAS, which also poses a health risk, according to the Environmental Working Group, a nonprofit public health advocate that tracks the contamination nationwide. A number of organisations – such as the Environmental Working Group and Safer States – said they were optimistic that states are making PFASs a priority. “This is a national contamination crisis at this point, and we’ve really only scratched the surface in understanding how large of an impact it’s having on health, both in highly contaminated communities like Clovis and across our entire population,” said David Andrews, a senior scientist for the Environmental Working Group. Scott Faber with the environmental working group says the EPA's plan lacks action and urgency. “This plan which is just a plan has no deadlines to clean up the mess we've already created,” said Faber.